During an appearance on CBS Face the Nation, Dr. Condoleezza Rice spoke some words of truth that may have surprised some critics of the former Secretary of State. During a decision about her youth in Birmingham, Alabama, the issue of race came up. It was during this segment that Dr. Rice commented that the U.S. will never get past a birth defect in which it was built upon---which is that of race. Now, I'm pretty sure a lot of people are wondering why she didn't speak on this topic while she was in a position of power to speak out about these certain things, but that's a question that only Dr. Rice herself can answer. 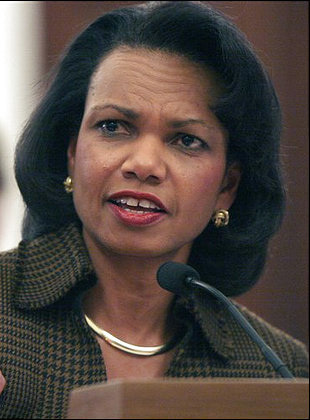 Former Secretary of State Condoleezza Rice said America has come a long way in confronting racial inequality - but that America will never be "race blind," and that race and poverty in America is "still a terrible witch's brew." Rice, appearing in Sunday's special Thanksgiving edition of "Face the Nation," reflected on how growing up in Birmingham, Ala., during segregation "shaped me fundamentally." "My family had to persevere under those circumstances to educate all of us, and to insist that we might not be able to control our circumstances but we could control our response," Rice told CBS' Bob Schieffer. Since those days, Rice argued, a lot of things have changed. "We have a black president. We've had two black secretaries of state. We have black CEOs. Obviously African Americans are pushing way into territories that, probably, my grandparents would never have thought possible," she said. Still, she argued that even though America has "gotten to a place [where] race is not the limiting factor that it once was," she said that "we're never going to erase race as a factor in American life." "It is a birth defect with which this country was born out of slavery; we're never really going to be race blind," she said. She pointed to the confluence of race and poverty as a particularly troubling constraint for overcoming inequality, and wondered if that problem isn't becoming even more exacerbated in recent years. "I think it goes back to whether or not race and class - that is, race and poverty - is not becoming even more of a constraint," she said. "Because with the failing public schools, I worry that the way that my grandparents got out of poverty, the way that my parents became educated, is just not going to be there for a whole bunch of kids. And I do think that race and poverty is still a terrible witch's brew."